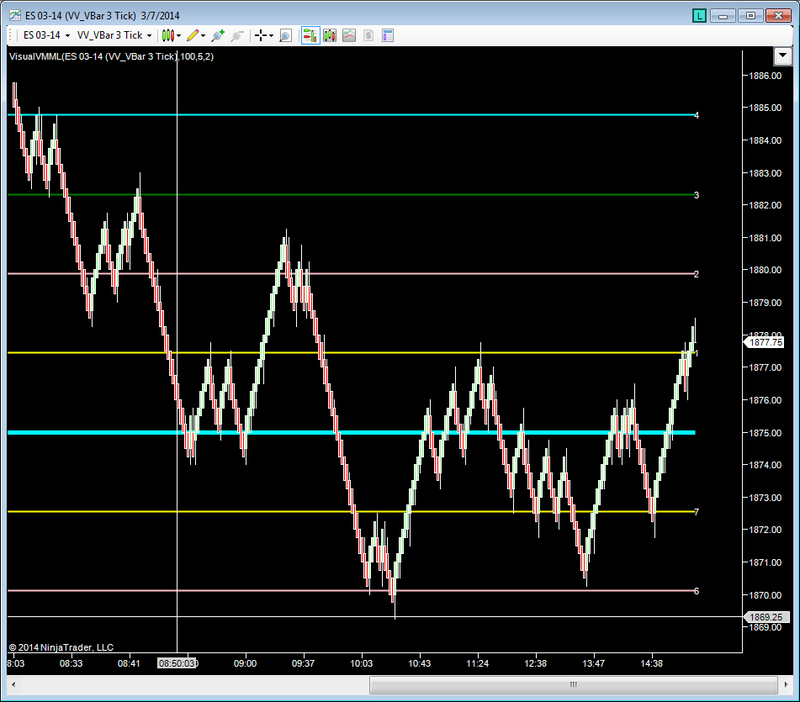 VisualVTrader's VisualVMML indicator is our specific version of Murrey Math Lines. While the original Murrey Math concept was difficult to understand, the lines do appear to have significant value. Because these lines are not calculated off pivots of daily, hourly, etc. charts, they are calculated mathematically based on the Murrey math concept and these are tradable in our opinion. These lines are drawn on the EMini chart with the VBar bar type. When the price crosses a line to the upside/downside and fails to close above/below the line, great trading opportunities exist. Each of these lines as shown are 10 ticks apart which is $125.00 but the distance is user selectable. The thicker line represents a high level MML line (MMLs are fractal in nature) and you can see that the EMini on Friday 3/7/2014 spent a lot of time on the thicker cyan colored line. It was support , then became resistance, and finally became support again at the close of the day.